Marcene Mae Buchs, age 84, of Alliance, died September 27, 2018 in her home. She was born March 7, 1934 in North Georgetown, Ohio, the daughter of William J. and Nettie F. (Stryffeler) Buchs. Marcene lived in Alliance all her life, spending her early years on a farm in Beachwood. She graduated from Alliance High School where she was a majorette, and from the University of Mount Union, receiving an Associate's Degree in Secretarial Training. She was a 60-year member of the Xi Delta Sorority. She retired from Cohen & Company Ltd., formerly Mather, Pfeifer and Potts, Inc., in 2004, after 27 years. 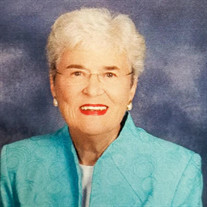 She was previously employed as an administrative assistant and executive secretary for 10 years at United Co-op, Inc.
She was an active member of Christ United Methodist Church in Alliance for more than 60 years where she was involved in Threads of Love, the Prayer Shawl Group, taught Sunday school, served as secretary for the Administrative Council, member of the Stewardship and Finance and Worship committees, sang in the Chancel choir and directed the youth choir. Throughout her life, she enjoyed tennis, golf, bowling, biking, knitting and reading. Marcene will forever be an adored mother, grandmother, sister, niece and aunt whose strength and compassion throughout her life were an inspiration to everyone who knew her. She is survived by a son, Michael R. (Amelia Stone) Johanson of Medina and a brother, Robert L. (Roberta) Buchs of Willoughby, three grandsons, Noah, Chase and Ellis Johanson, two nieces, Kristen Buchs of Sycamore and Tracy (Dr. Scott) Shell of Chagrin Falls, three grand nephews, Zachary, Cody and Matthew Shell and many cousins. The family will receive friends from 10 to 11 a.m., Saturday, October 6, 2018 at Cassaday-Turkle-Christian Funeral Home. Funeral Services will begin at 11 a.m. with the Rev. John Partridge officiating. Interment will follow at Highland Memorial Park. Memorial contributions can be made to the Christ United Methodist Church, 470 E. Broadway St., Alliance, Ohio 44601. Arrangements are by Cassaday-Turkle-Christian Funeral Home.